Chocolate, Pilates, Shoe Making, Woodworker, Jeeper, Coffee, all around jack of all trades. Tool Chest By Paul Sellers Part 4, hardware and tools, complete. 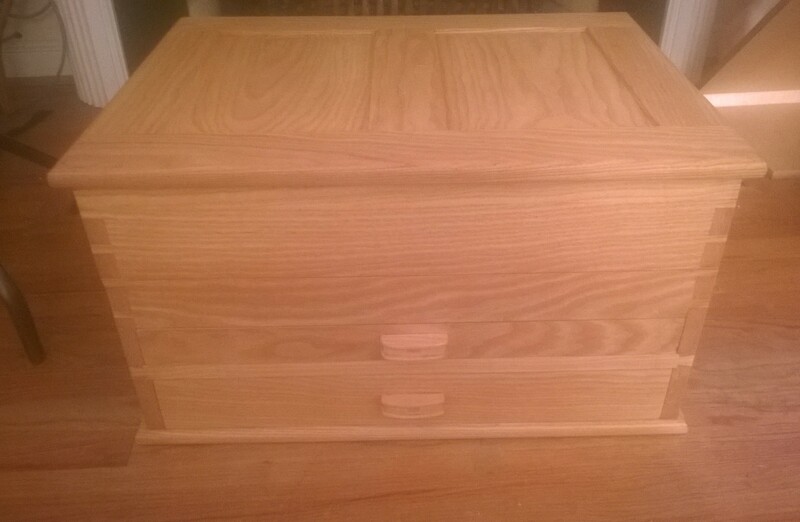 With the top and carcass complete, drawers are done. Its time for hardware, shellac and tools! 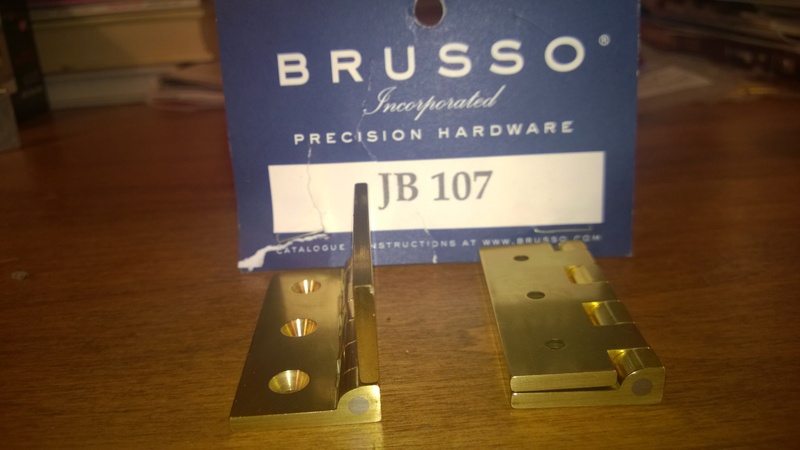 Lets start with Brusso hinges. A separate blog post covers these but they are so well made they deem mention again. The machining is fantastic and all the specs are on their website. I picked up this set form toolsforworkingwood.com. The install was a learning experience. Brass wood screws do not like hardwood. They like soft pine. Solution, use a steel screw first then replace it with a brass screw. Sounds intuitive, its not :). It took be 4 broken screws before I got this down solid. After the hinges were installed I added brass chains on both sides for added support. The lid is quite heavy so every extra bit helps. 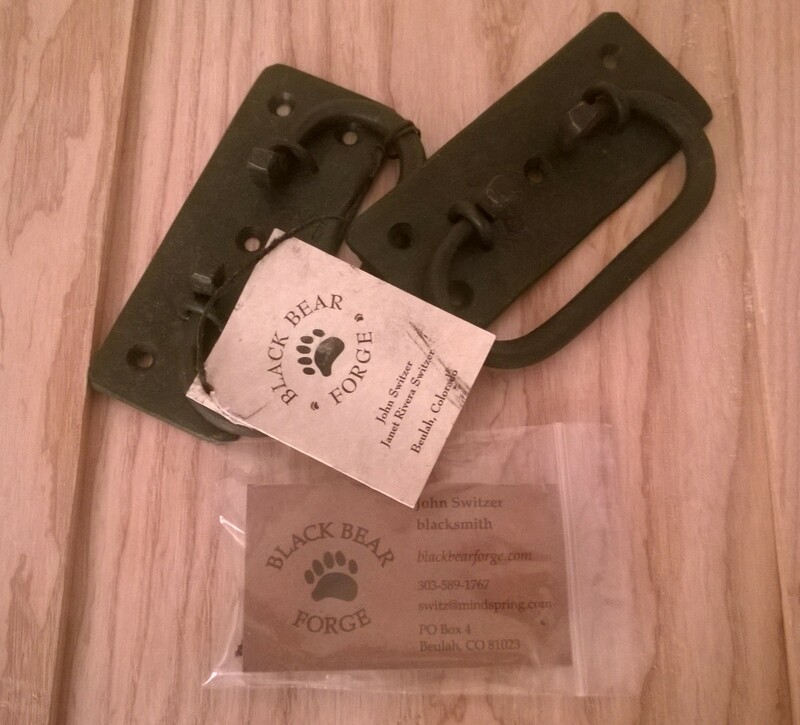 Hinges are hand forged iron hings from Black Bear Forge. These are some solid handles that can support the weight of this tool chest. This chest is meant to be moved. The other choices on the internet were disappointing as most could not hold any weight. The remaining available ones at the hardware store and amazon had no style or character. After all the work on the chest I wanted something that stood out. Lid is installed with the Brusso Hinges and the handles are attached and a few coats of garnet shellac from Tools for Working Wood and a coat or two of bowling alley wax. 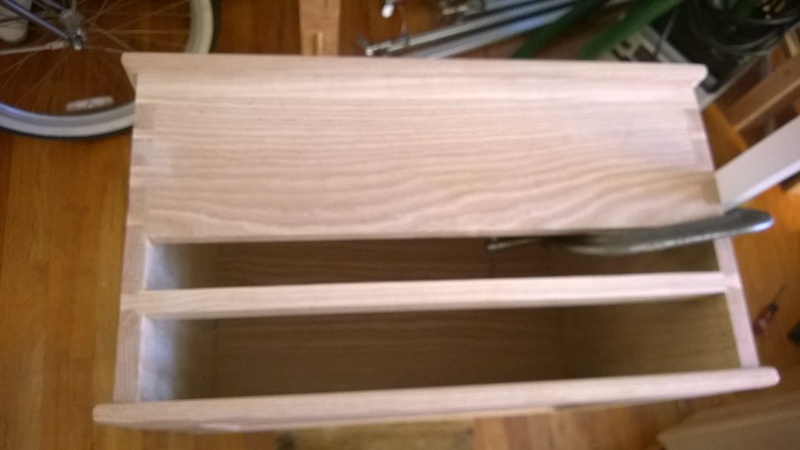 I did not have many shots of the drawers, the wood handles are mortised into the drawer front. Lots of room for the most popular planes I use. 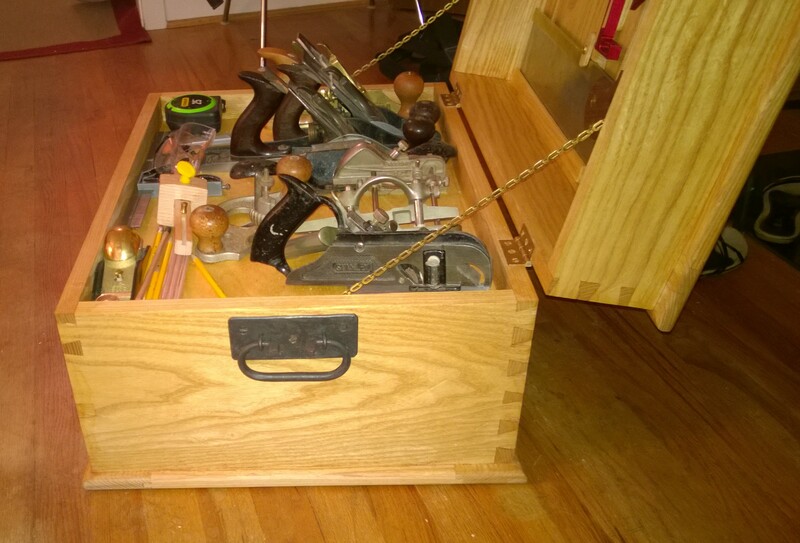 No its not the Anarchist Tool Chest, but it can hold most all the tools I used to make the chest and then some. 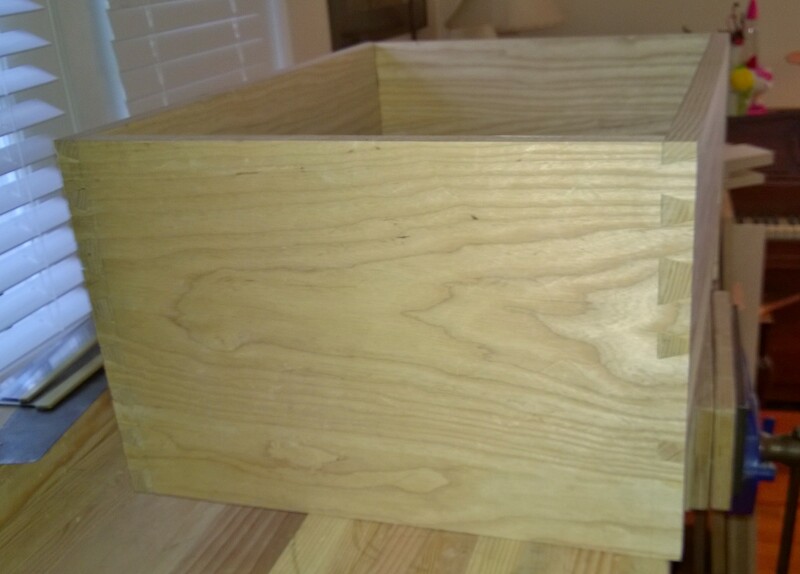 For some space saving I glued up some scrap pieces and attached them to the inside of the lid to hold my sash saw and dovetail saw along with my go to Woodpecker squares. 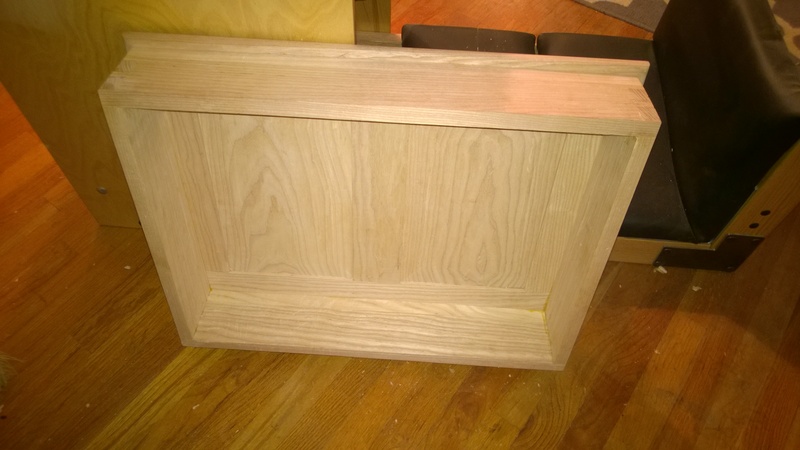 The top is a raised panel door and the bottom is a just a plywood panel set into a mortise and tenon frame. First a Record 44 plow plane to cut the grooves. A complete stack of rails and stiles for the top and bottom. Skipping a bunch of steps as I do not take as many pictures. All the videos are available on Paul Sellers site. 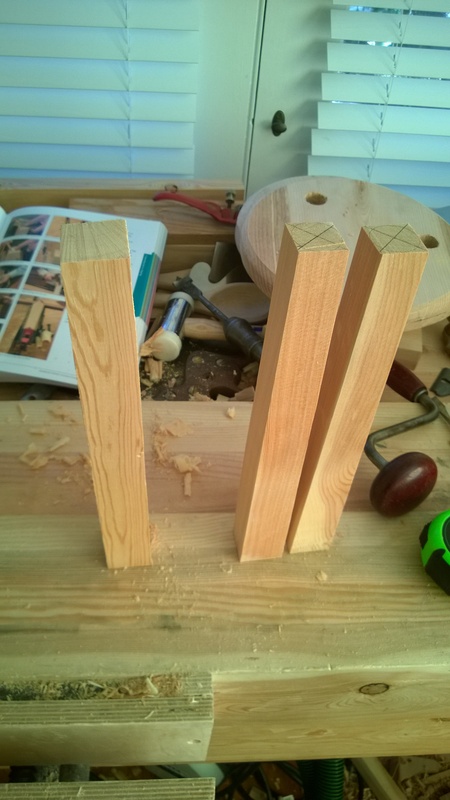 The mortises are cut with my Sash saw and cleaned up with a router plane. The mortises were chiseled with a bevel edge chisel the Sellers way. Getting read to final fit and assembly. 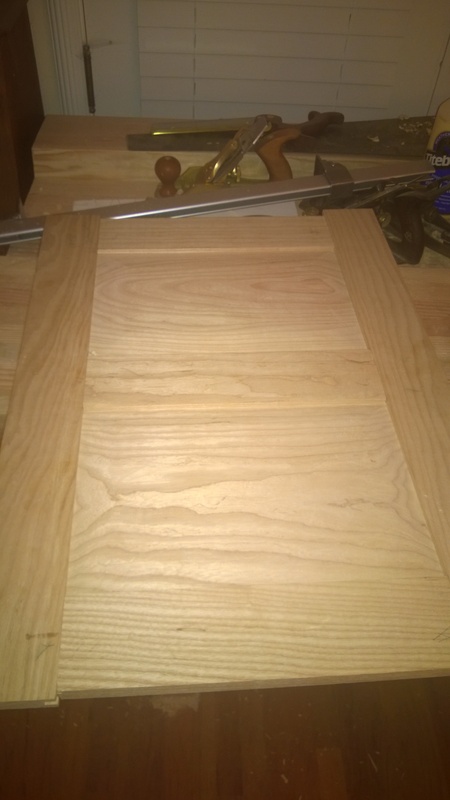 The panels are 5/8″ thick, I had to take 7/8″ stock and plane it down. 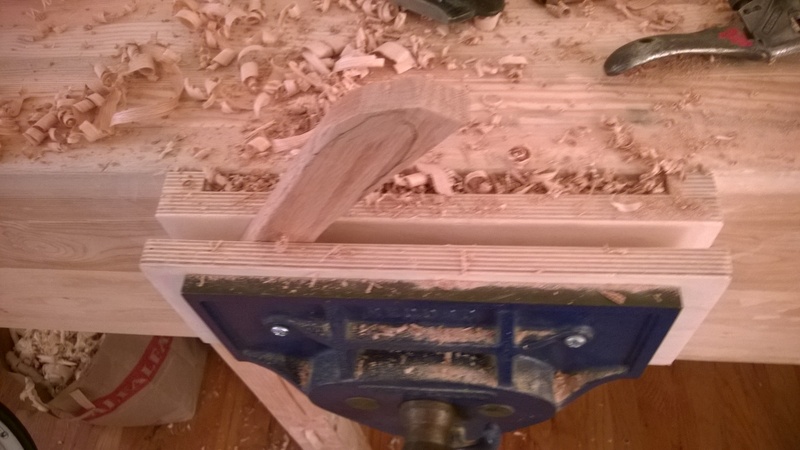 I did this with my #5 set as a scrub plane and then cleaned it up with a #4. Dry fit and glue up. Gluing the top and bottom to the carcass. Everything went smoothly. The only error was a shoulder line that can’t be seen in the final build. I am better at mortises than dovetails. All ready to be cut in half now! It all started off so well 🙂 I had a guide, a pencil line and then it went so so wrong. 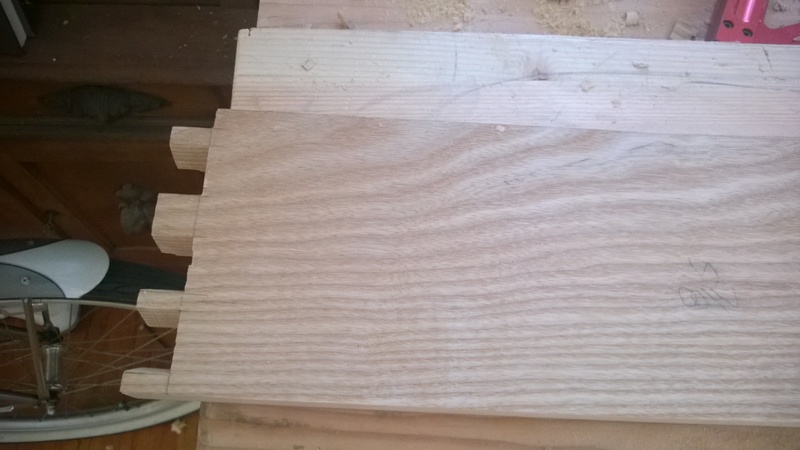 The front, I wasn’t paying attention for a few strokes of the saw and it went off the line by 1/4″. This means I lose a 1/4″ of height. Luckily I added a good inch or so of height before I added the lids due to my incorrectly measuring somewhere along the line. 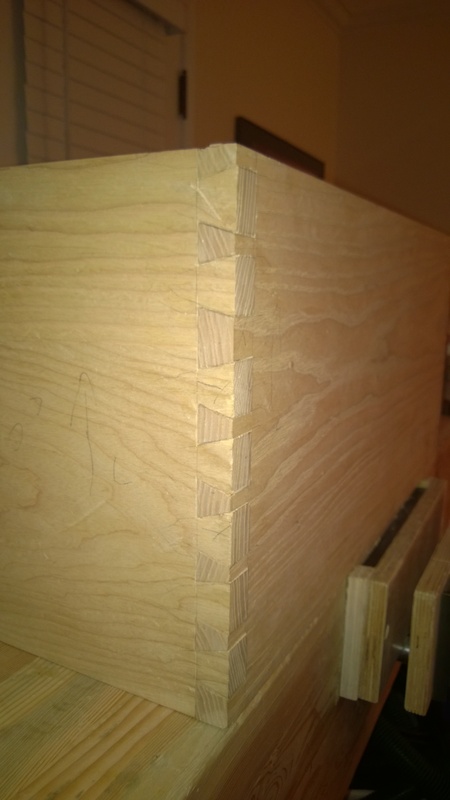 I topped the carcass with a 1 inch wider or so piece mitered at the corners (held together at the miters with a domino, yes its wrong, I know but I didn’t care). 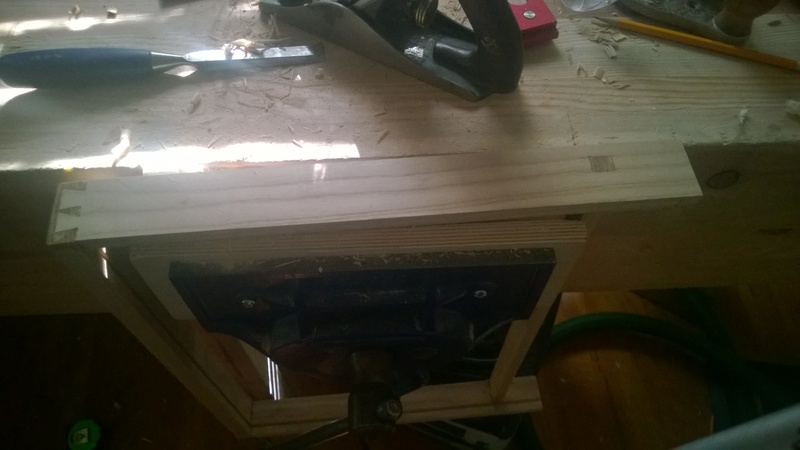 I had to plane off that 1/4″ from the top and bottom and level things all out. The drawers were next and I did not get a lot of pictures. 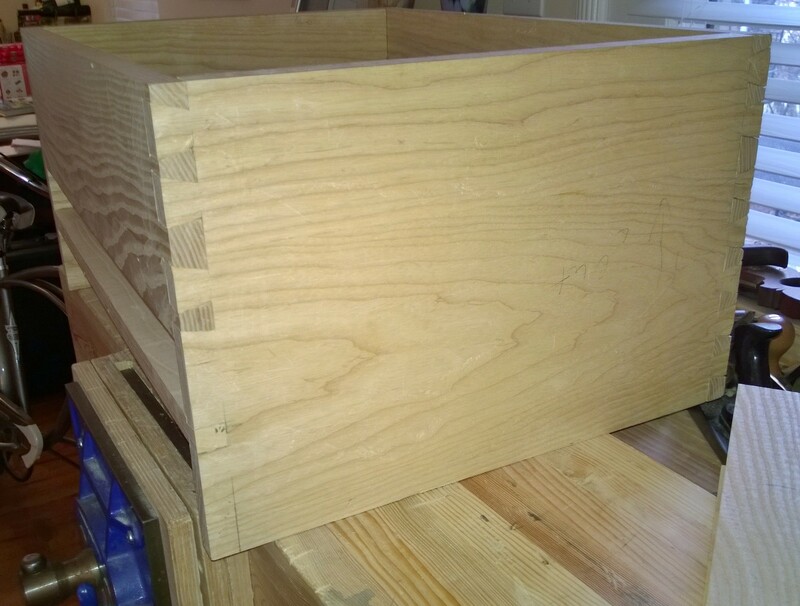 The are half blind dovetails with a grove for the plywood. 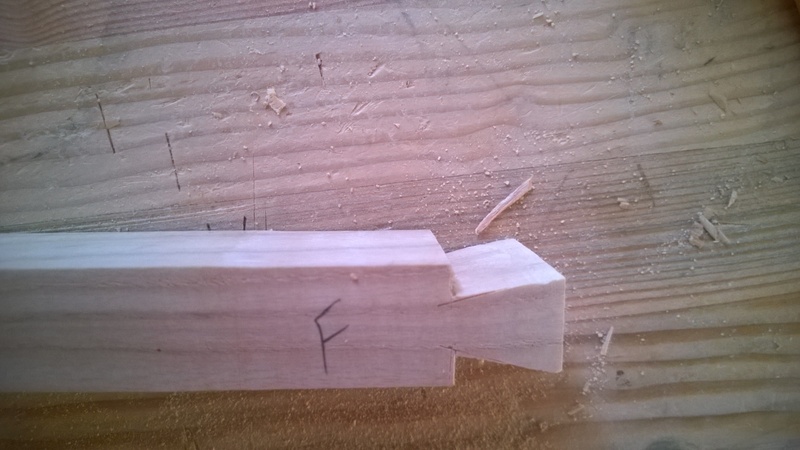 There is also a mortise with some wedges to add stability. These drawers are rock solid. Time to start putting the chest together. 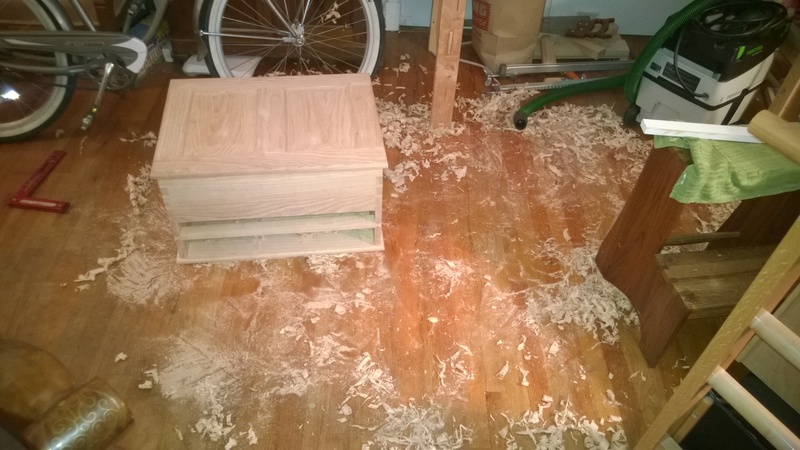 I had followed Chris Schwarz’s recommendation and cut dovetails in pine every night for a month. Well it worked out to often but not every night. I think this can be a good practice but not if your technique isn’t changing or you haven’t mastered sharpening. I found Paul Sellers videos with his knife line and chiseling and was sold. The biggest problem for me was the shoulder lines being consistent and not pushing into them. 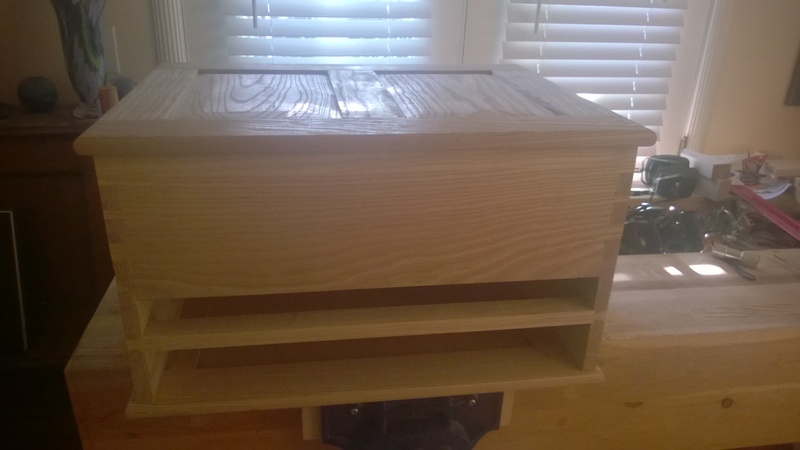 Ash is a reasonably hard wood but I still managed to have not so great dovetails. 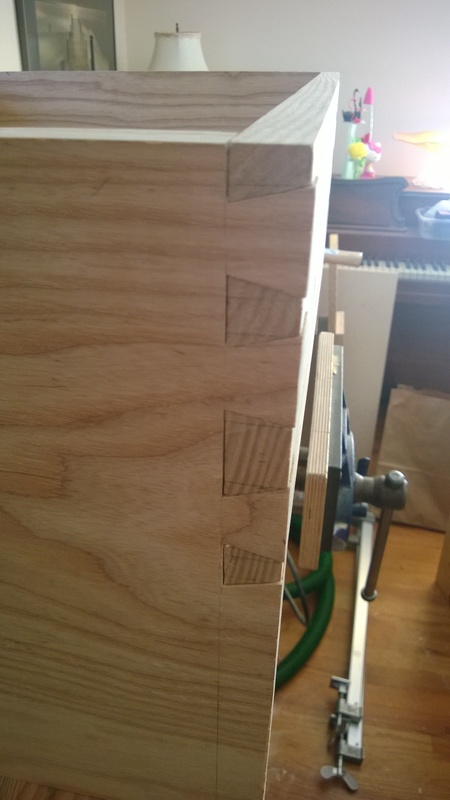 I attribute my first crappy dovetails to my lack of precision on the shoulder lines. 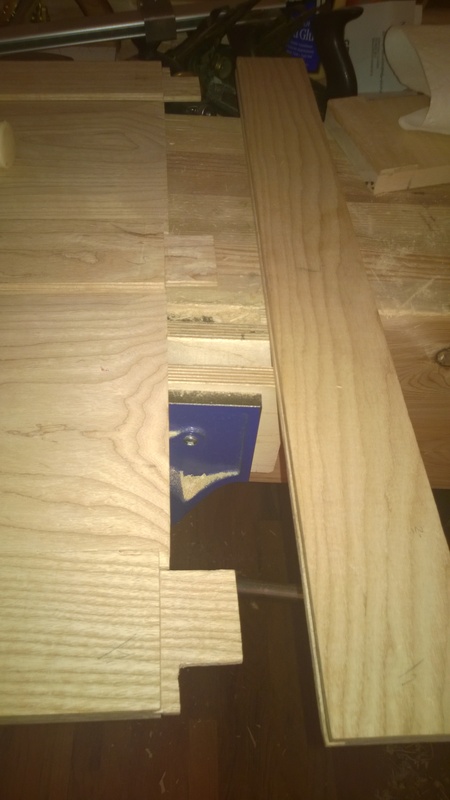 Some overhang allowed for cleanup of the not so perfect fitting dovetails. More practice is definitely needed in layout more than chiseling. The dovetails did get better as I moved along. Two sides and the back ready to go. \ Once again no so perfect on the front. 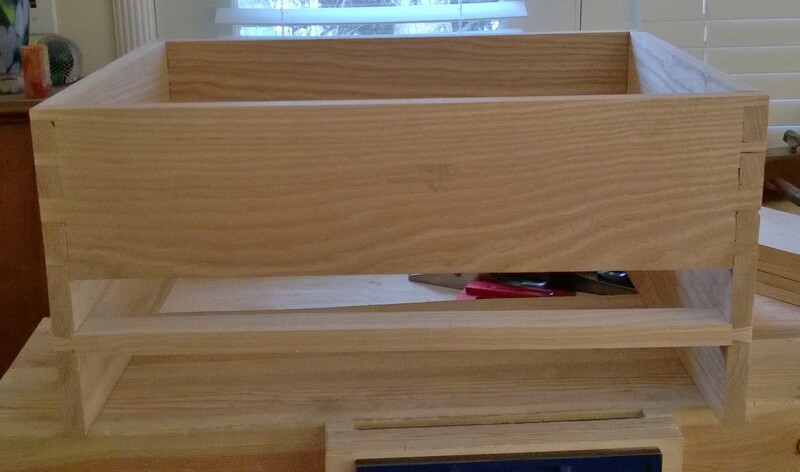 The dovetail for the drawer divider was actually quite easy to do on the first try. Ready for glueup. All glued up and planed. I did get some wood swelling that filled in the minor gaps I had on glue up. 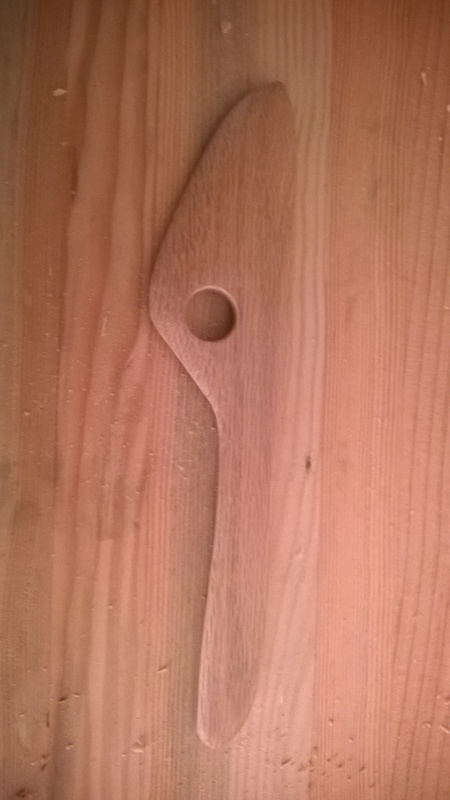 I also used the sawdust from my bandsaw when I did the ripping and resawing and mixed that with some wood glue and used as wood filler. This filled in the remaining gaps that in the end are no longer visible. 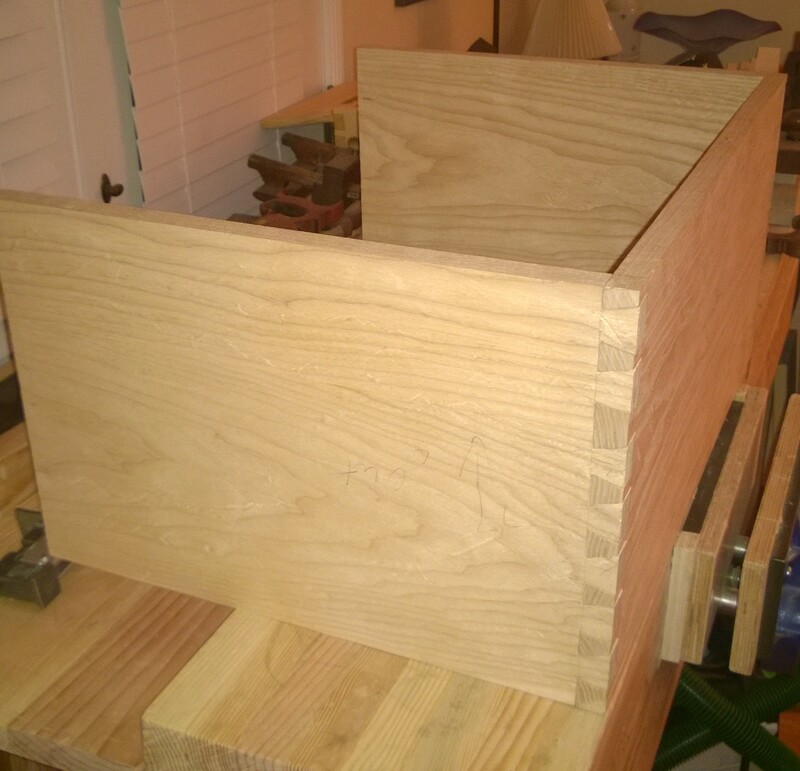 So I can imagine if my dovetails improve the fit and finish will as well. A different view. The chest is coming together nicely. Next is the top/bottom and sawing the carcass in half. 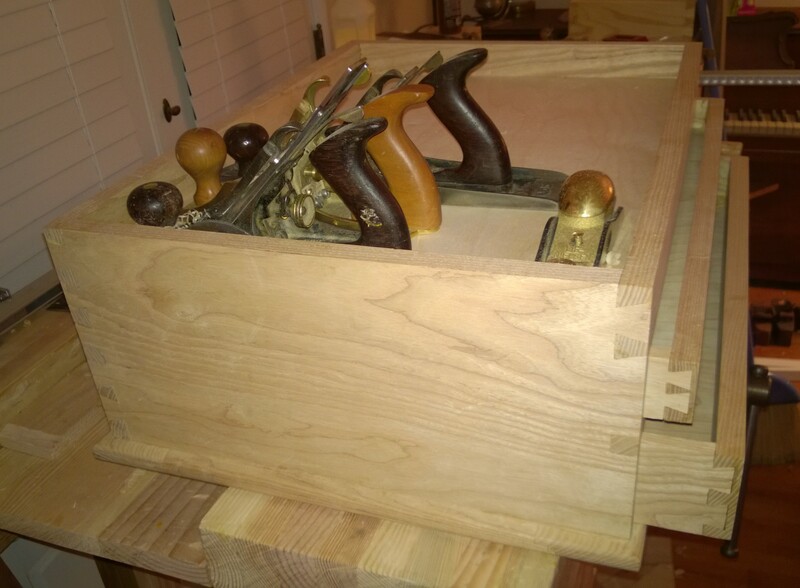 Having collected some hand tools, mainly planes and spokeshaves, I needed a place to put them other than the tool well. Where was I to go, I tried to find one, but the plastic cases at the big box stores had no appeal and just were not practical. Even my favorite Festool had nothing that appealed unless I could combine a max systainer with a sortainer and it still would not have any style. So left with out a purchasable choice I had what I considered two options: The Anarchist Tool Chest by Chris Schwarz (a very good book btw and you should pick up a copy here) and the Paul Sellers Tool Chest. 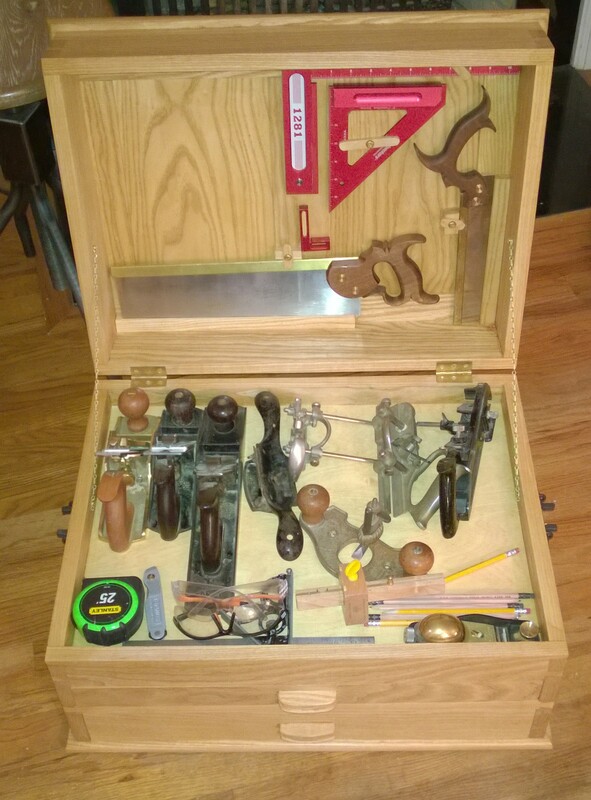 I had to rule out the Anarchist Tool Chest due to my shop being on my front porch, I needed something portable. Not that my neighborhood is full of thieves but I am not leaving a tool chest out there. I’ll save that for a later build when I get some molding planes. 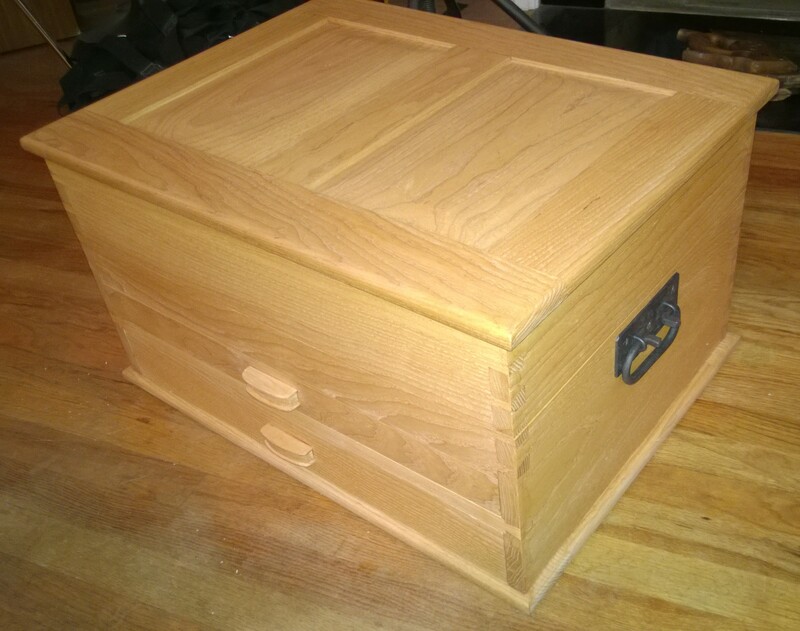 I searched through Paul Sellers WoodWorking Master Class Site and found the tool chest gallery. A shameless plug for Paul’s site, if you have any interest in hand tool woodworking or woodworking, his site is 15 bucks a month if I remember right and that gives you access to ALL videos and the ability to download the ones since you joined. So off to Paxton Lumber in Denver to find an appropriate wood. I checked out Mahogany, $$$ per board foot, not a good first big project wood for me. Pine, almost went this route since that was used in the Anarchist Chest but I thought it would be too soft and I had worked with a lot of pine already. 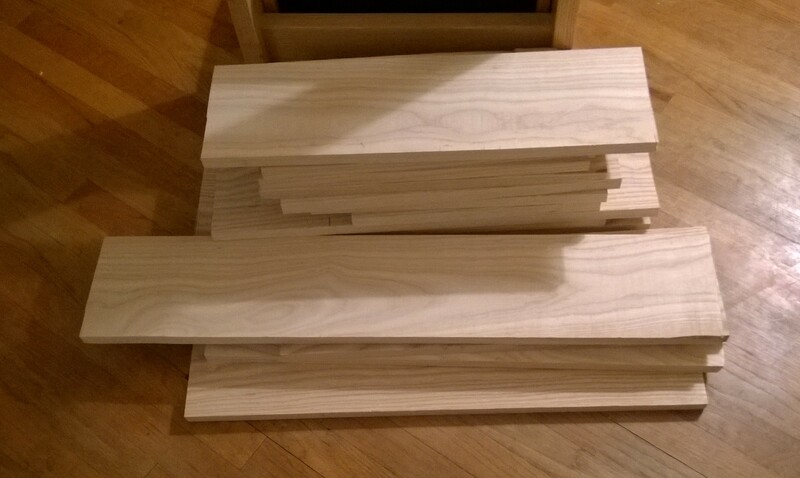 So I went with Ash, it was cheaper than Mahogany and more expensive than Pine. I sized most of these up with the hand saw. 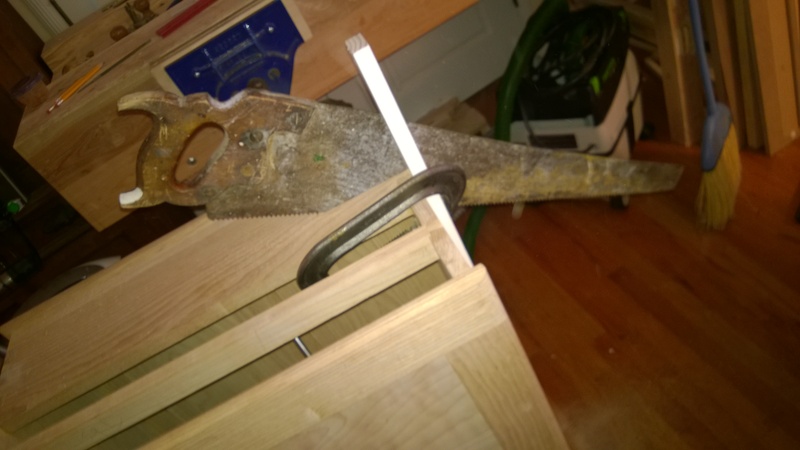 Actually a Gramercy 14″ sash saw from Tools for Working Wood (my favorite store after Lost Art Press). I am short a good crosscut saw but the sash saw did fantastic. The stacks below are ready for ripping. My hand saw for ripping needs the teeth set so I opted for my bandsaw. Who am I kidding, even if the teeth were set I would have used my bandsaw. All ripped down and ready to go. 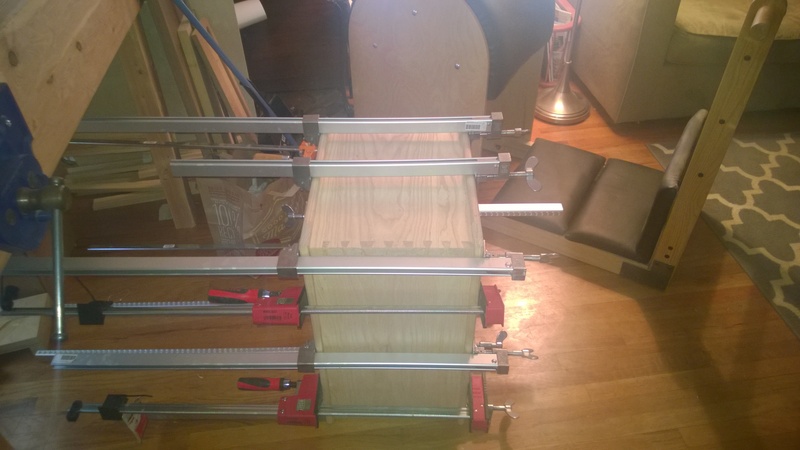 I re-sawed a few pieces on my bandsaw for the drawer sides and backs then cleaned them up with my #4 Bailey. I did thickness plane down the raised panels with my #5 set up as a scrub and cleaned up with the #4. 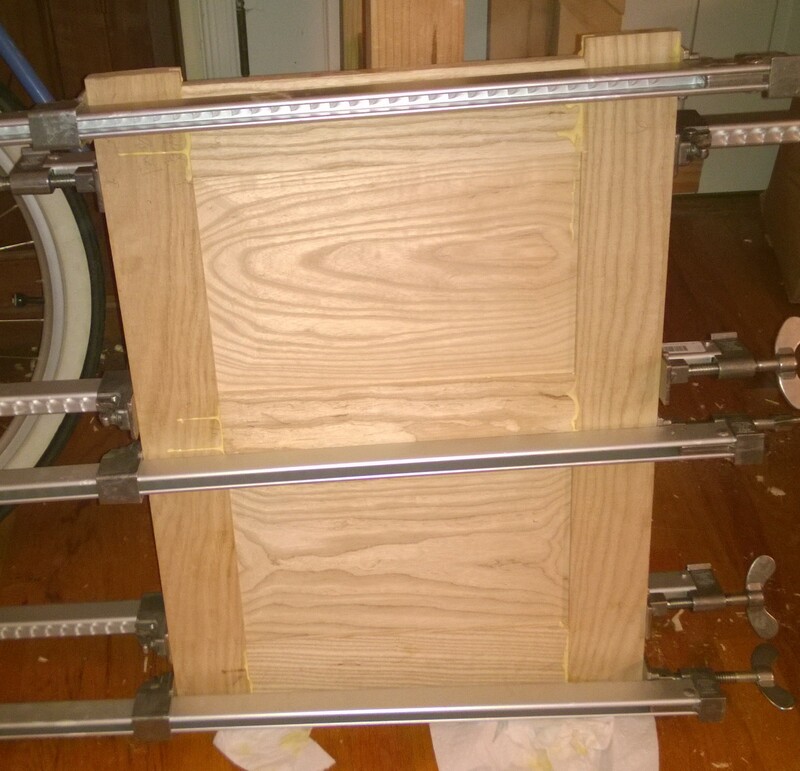 I only used my surface planer for some 1/2″ x 1/2″ strips to hold the drawers and panels. 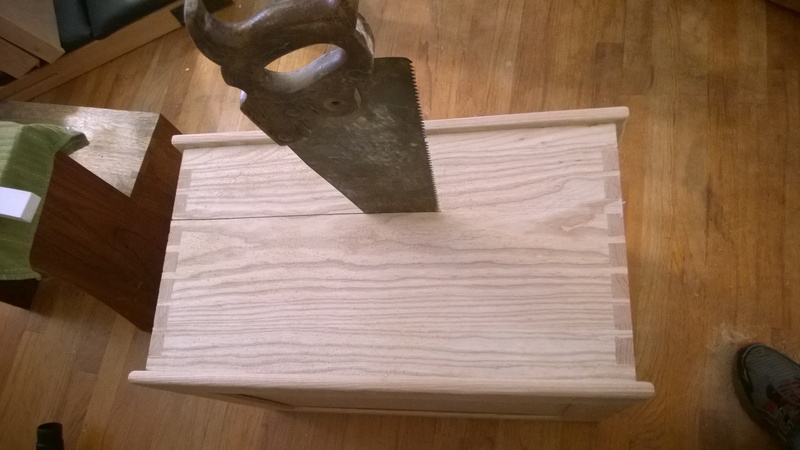 Next post, I try dovetails in hardwood. 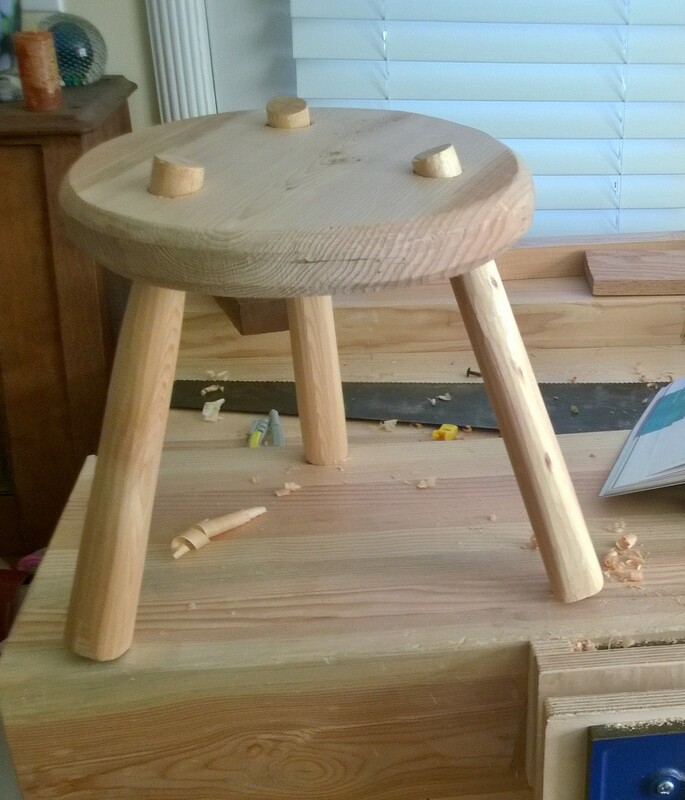 Next up from the Paul Sellers book, the three legged stool. 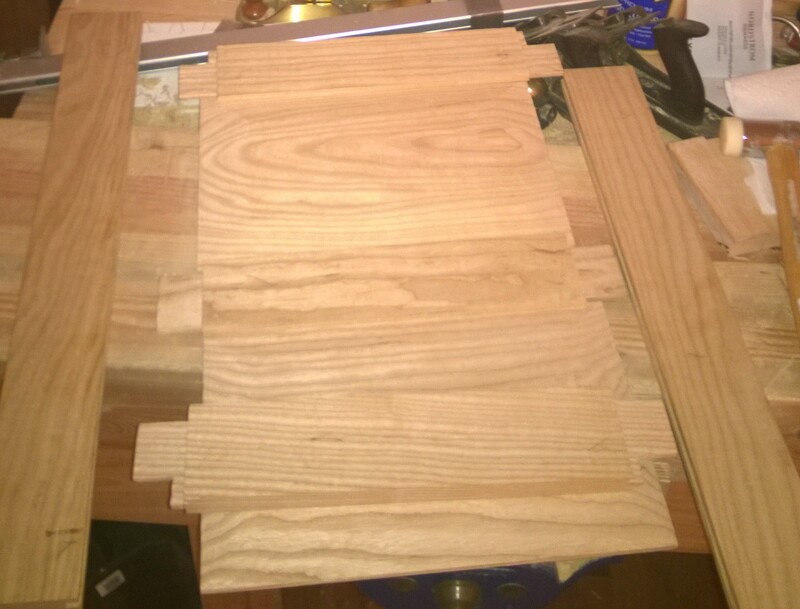 Starting with a 8′ long 2×12 of douglas fir I cut out two squares. 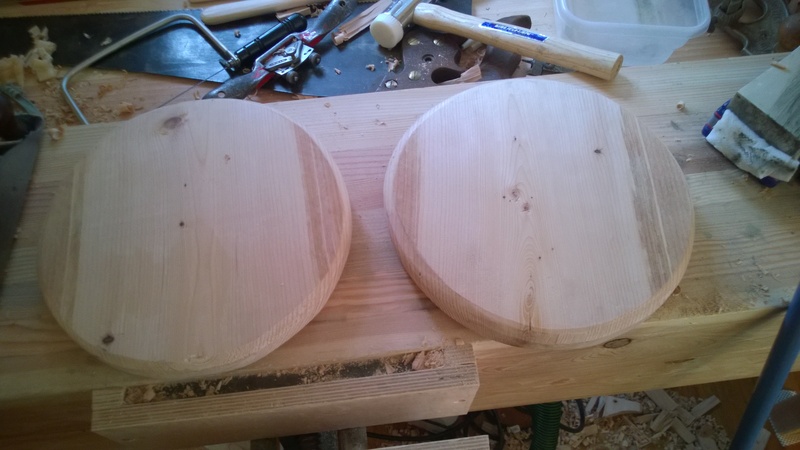 One I cut out on the bandsaw, the other with a chisel. The one on the right in the following photo was with the bandsaw. 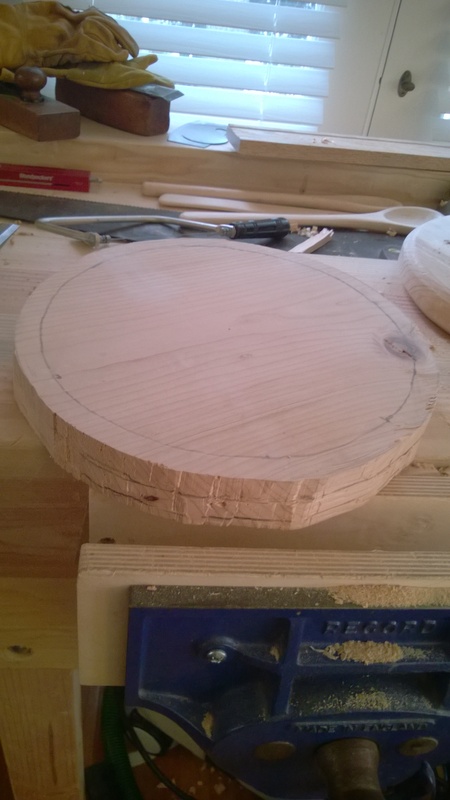 It was quick an easy, I could have also used my router with the circle cutting jig, or used a circle cutting jig on the bandsaw. 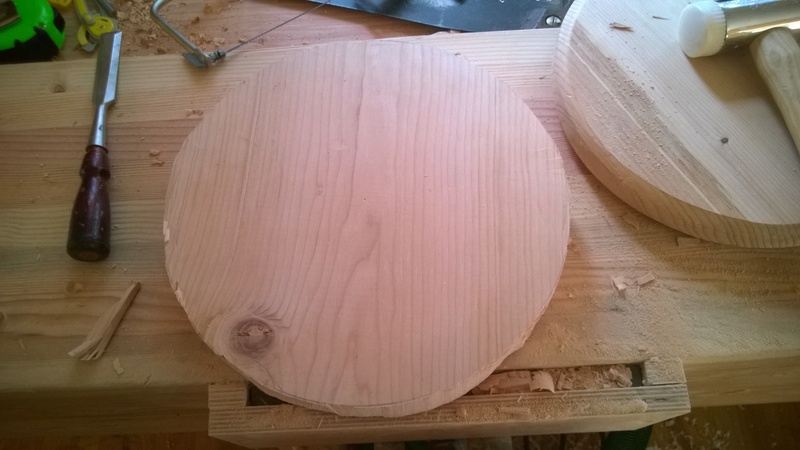 I see no problems with how its cut out, the end goal is a circular piece of wood. Figuring the point of the book was also to try new techniques, I made a second seat. 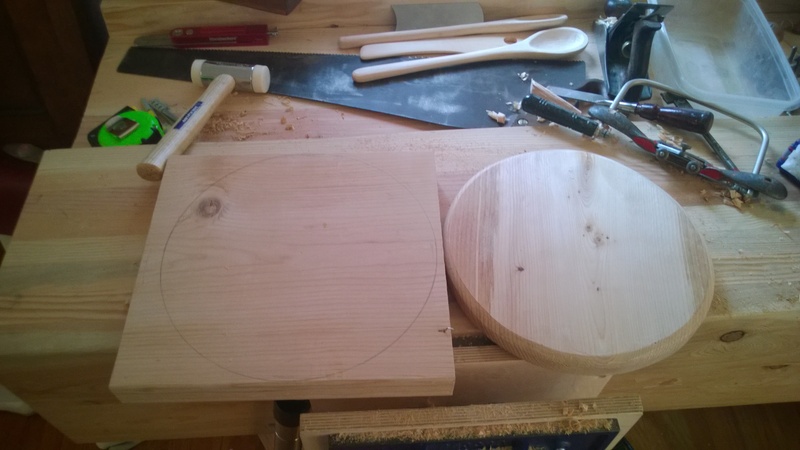 Chiseling a circle is actually remarkably easy. 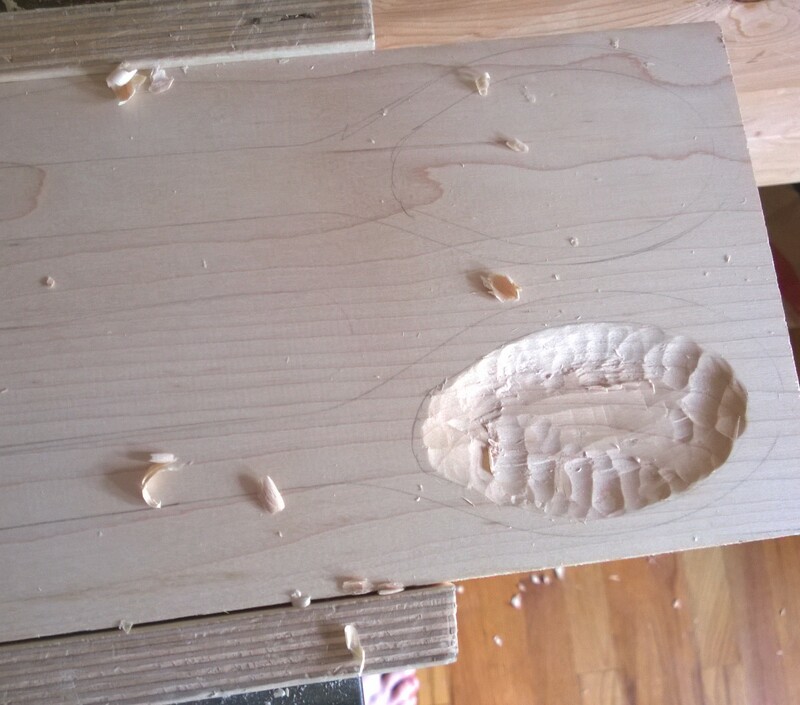 The grain was pretty straight so it split of quite nicely. So if you don’t have a bandsaw, don’t fret a chisel works just fine. I did have to be careful as I got very close to my line. All done, not so bad, next round I’ll stick closer to the line all the way around You’ll notice the coping saw in that picture, I did use it to take care of some of the cross grain on the ends, easier than the chisel. 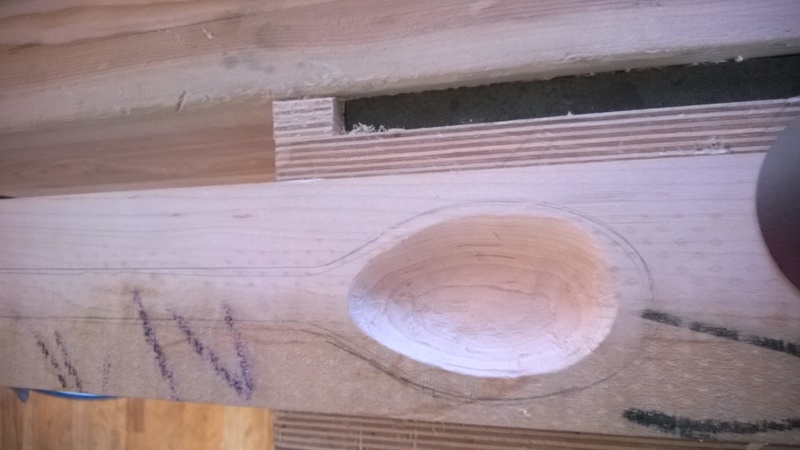 Marking the seat with pencil to help guide the spokeshave rounding over of the seat. 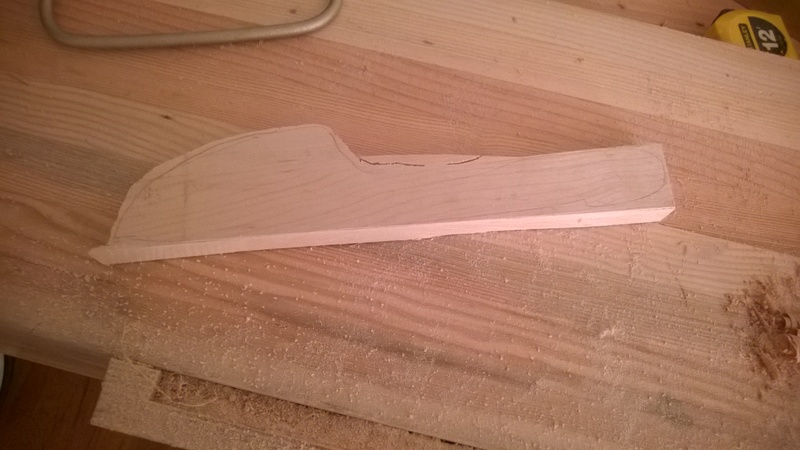 The first seat I forgot to do the guidelines and my experience with the spokeshave made for ok results. The guidelines on the second seat made things go much faster and more uniform than without. The Record 151 Spokeshave made yet another appearance here. Both seats ready to go. Next up was drilling the holes. I used a brace and bit. 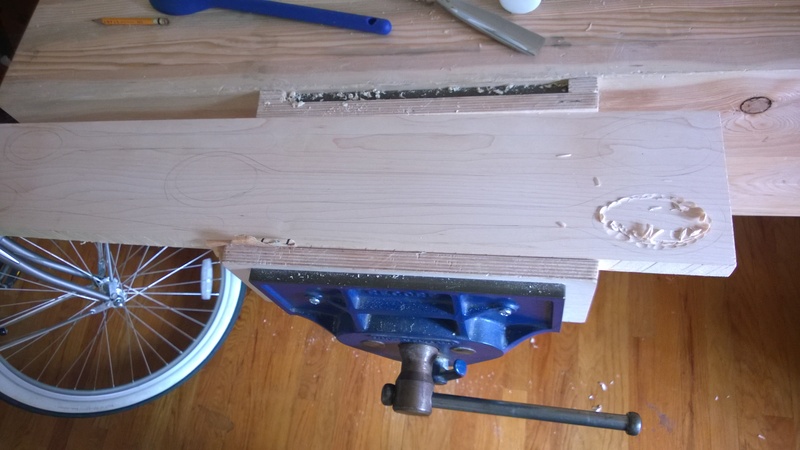 The first seat I used an adjustable sized bit to drill the holes as I did not have a 1″ bit. The adjustable did not cut cleanly through when I switched sides. As soon as it broke through it was off center and you are done. This left me to have to clean the rest out with a rasp. 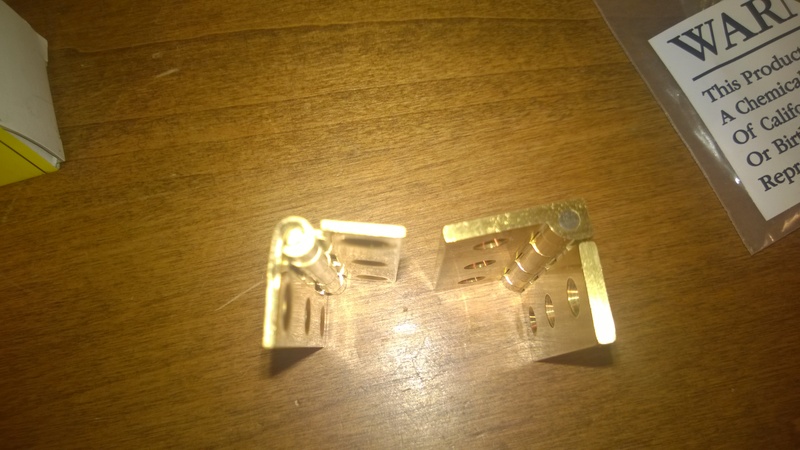 So I ordered up some old “vintage” bits from Ebay, maybe I’ll show them in another post as I am missing the photos but it included a 1 inch bit. The 1 inch bit worked better than the adjustable as it stayed self centered when drilling from both sides. Marking the centers of three legs preparing them to round over. I ripped these on my wood bandsaw. Rounding the legs over with the #4 Bailey plane. 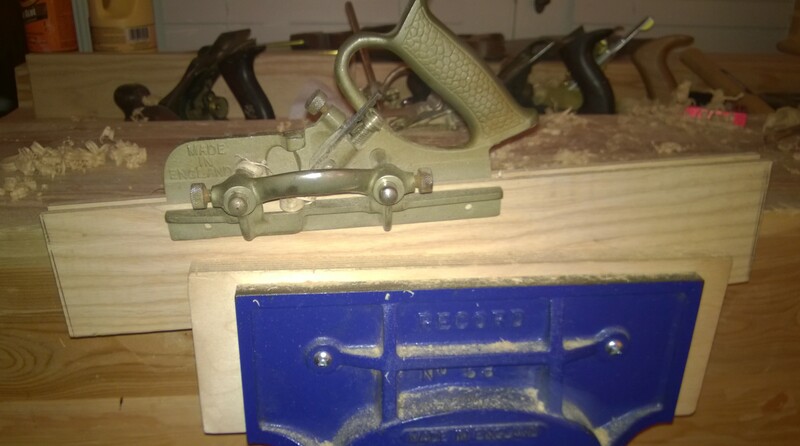 Notice the bar clamp, this one from Tools For Working Wood, made by Dubuque Clamp Works. Heavier duty than what you can find at harbor freight and super light (cheaper than my steal clamps and way lighter, happy to get them from an American company). As Paul says the bar clamp in the bench vise makes for a great way to work without a tail vise and placed the work up where it is easy to handle. I worked one at a time and test fitted as I went. Be sure to mark which ones go where once you start fitting. Three legs fit and ready to assemble. The ones in this photo still need the bottom of the legs rounded over. Ready for slots to be cut for the wedges. I used Oak on one and Walnut on the other. 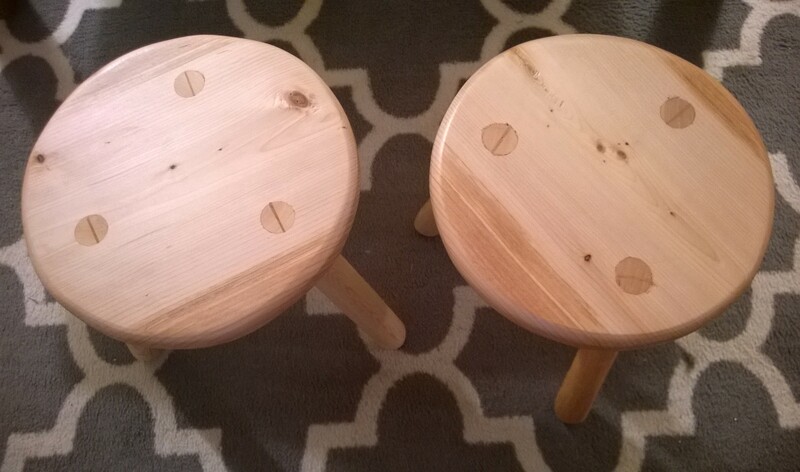 Both stools are complete. Bandsaw version and the chiseled version. 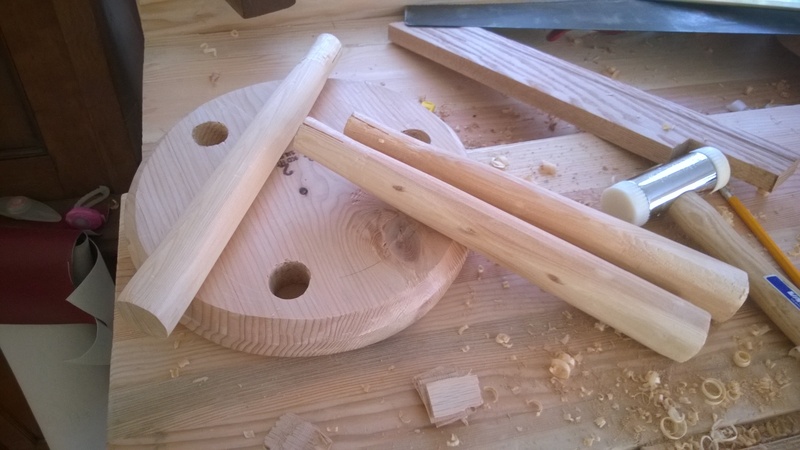 Spokeshave didn’t care 🙂 It was nice to build them without a lathe as I have not room for one at this time. Lightly sanded with my festool sander/vac combo and given two coats of shellac with a light hand sanding between coats. These will be shipped of as a gift for friends who just had twins. Since they are 12 inches tall they should be a perfect fit in a year :). 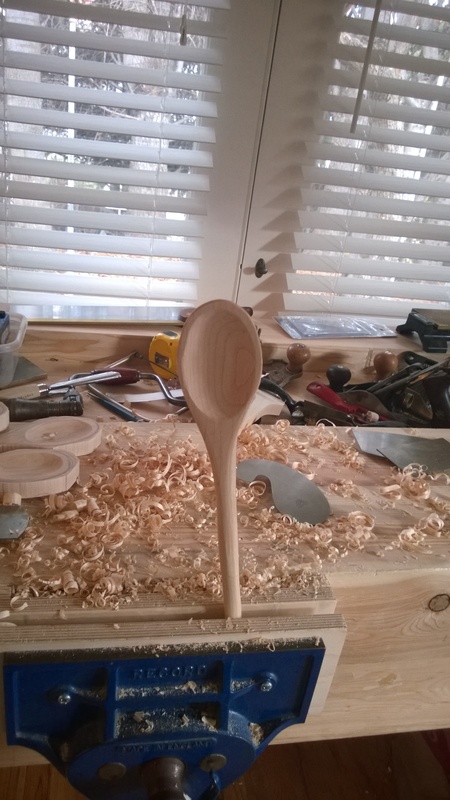 After making the spatulas from Paul Sellers book I decided to try my hand at making a wooden spoons. 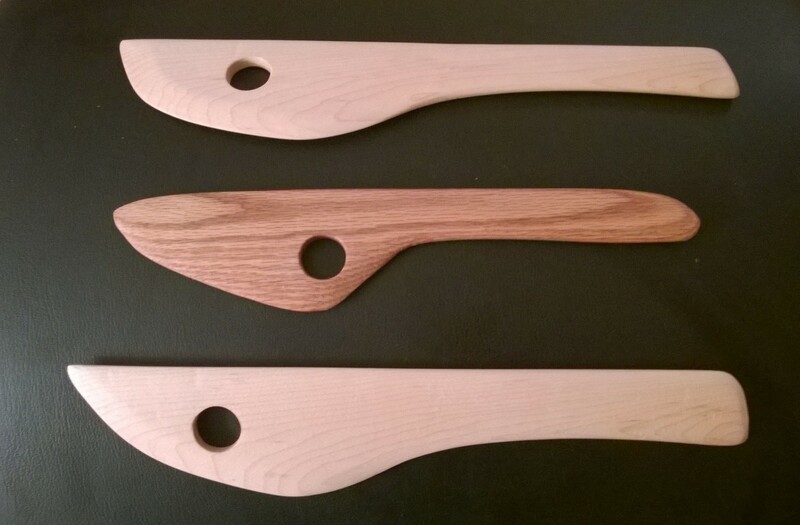 I broke the last wooden spoon I had and figured I could give this a shot and make some new ones with larger handles. I stopped into Paxton Lumber in Denver and founds some maple cutoffs in the 50c per board foot box. Score! I had a set of two plastic spoons that I do like that I used for a template. I would go with bigger handles to make them easier to hold and harder to break. First step, trace out the spoons. You can see I fit 5 on this board. 2 small ones and 3 large. 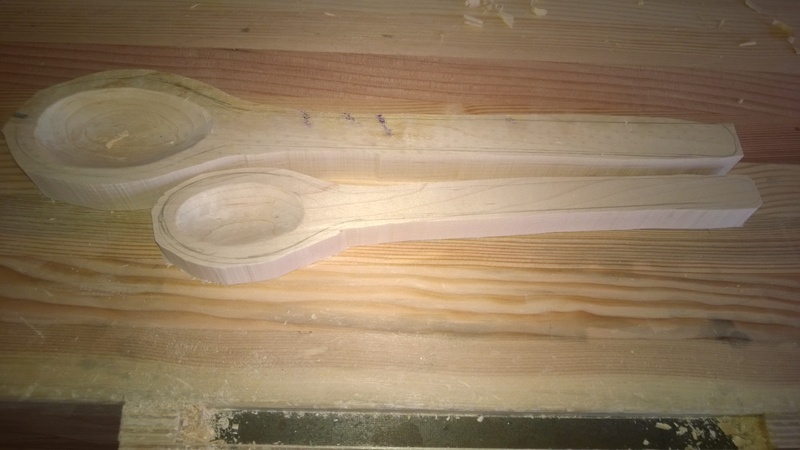 Using a Two Cherries 7/20 gouge I started to carve out the spoons. I got lots of practice as I had 6 to work on. 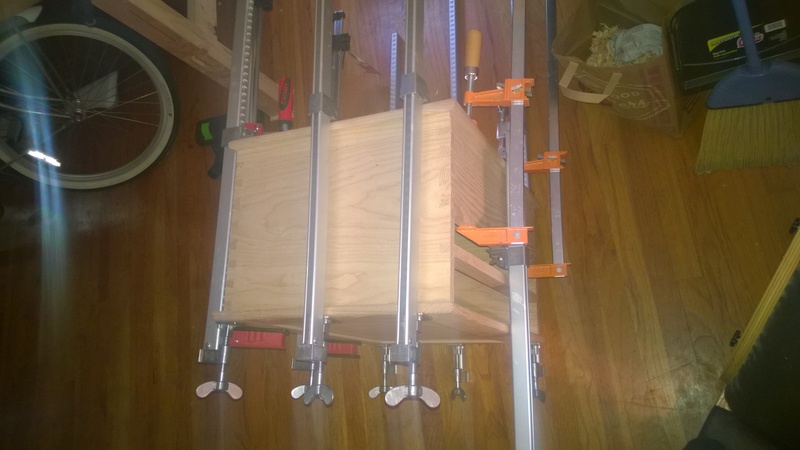 Much easier to get it all out of the way while the board clamps solidly in the vise. 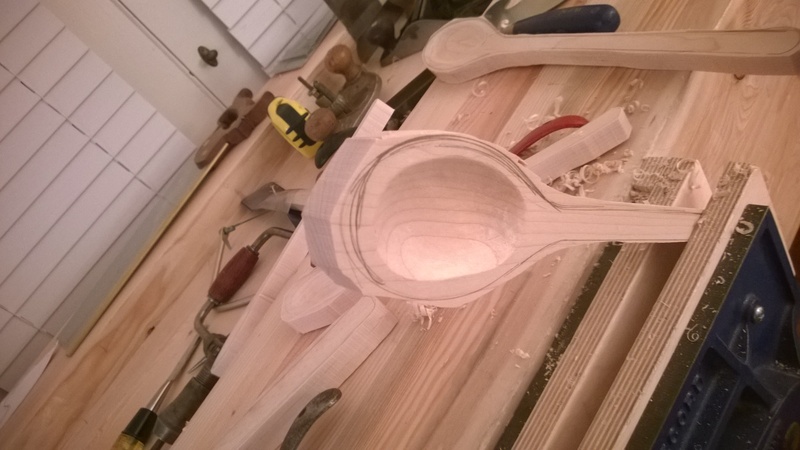 I used the smaller spoon as the inside template for the large spoon. For the two small spoons I just moved the small spoon I was using as a template and retraced it a few times until I had a good 1/4″ boarder. The gouge laughed at the maple and cut through it without much trouble. I have not learned how to sharpen the gouge yet, it made it through the spoons without dulling. 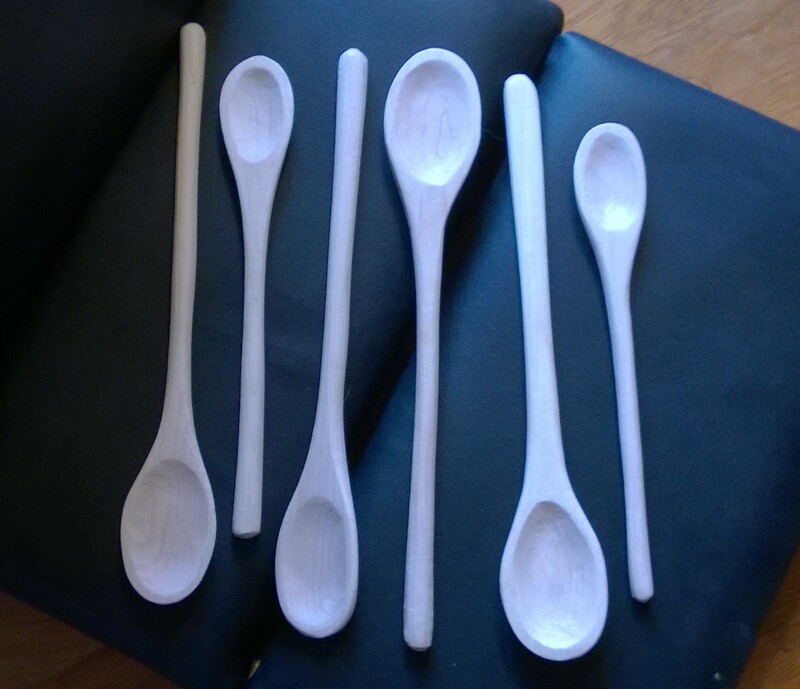 The first 5 spoons carved out ready for the bandsaw to trim them out. 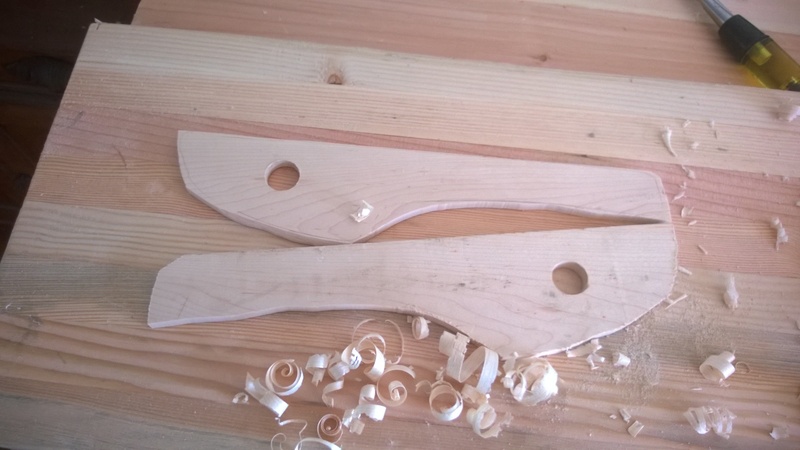 2 blanks that are ready for the spokeshave. 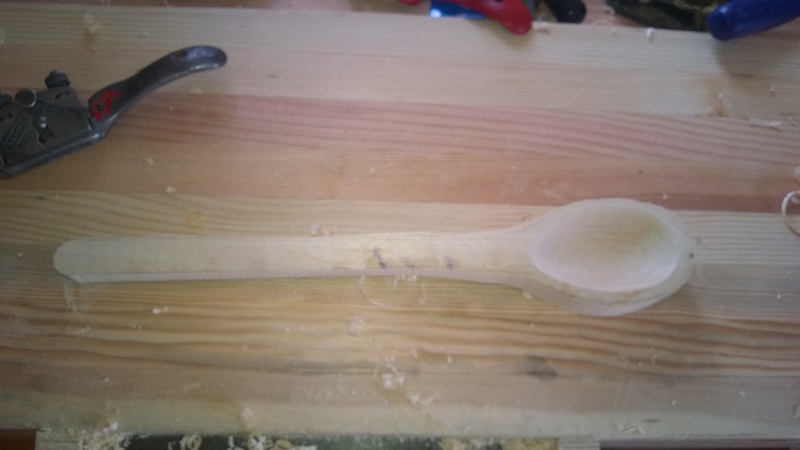 The other board was extra thick so I made a deeper spoon. Roughed out and ready to go. I did take this one back to the bandsaw to trim the top as maple is hard wood and that is mainly end grain. The large spoon I trimmed the handle as well since this one would be a flat handle unlike the others which are round. Let the trimming begin. Sharpened the Record 151 flat bottomed spokeshave and got to work. First starting with a thick cut and then fine tuning for the finish work. Maple is not the softest of woods but this sharp spokeshave made quick work of it. Grain direction was elusive sometimes, I was changing directions regularly until I figured things out to minimize the tear-out. I started with the spoon part first, doing one side then the other. 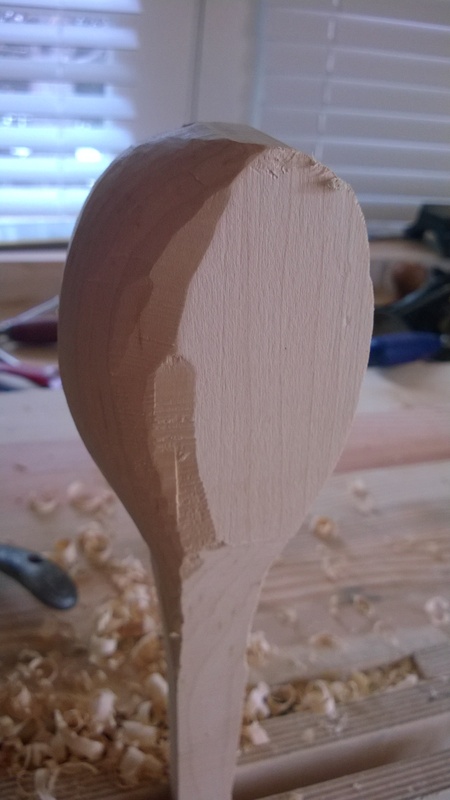 I would occasionally use the round bottom Record 151 spokeshave for the tight curves where the spoon met the handle. The round bottom was much harder to use but I am starting to get used to it. 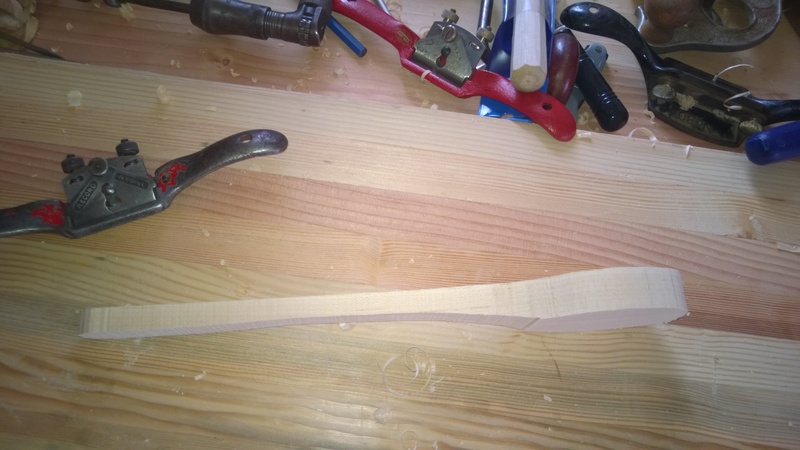 Once all the trimming was done I would finish each spoon off with a scraper to remove any tear-out and spokeshave lines. Made for a pretty good looking spoon. The final set of 6 ready for finish, most likely mineral oil. Are they perfect, no. I could have sanded the ends of the handles on the belt sander for a nice slick round end. 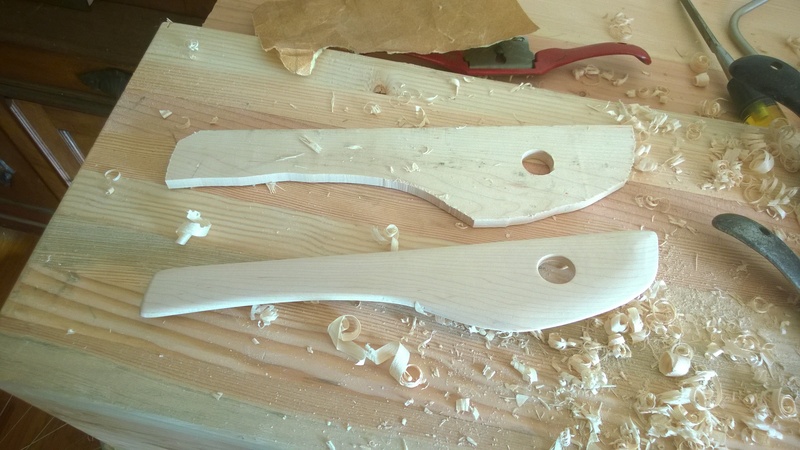 I chose to round them instead with the super sharp spokeshave and leave them uneven. The Record 151 did quite well on the end grain. I have seen places recommend a low angle version for end grain. Maybe down the road I’ll try a low angle spokeshave or get a kit like this one from Tools for Working Wood. In the mean time, a very sharp 151 works just fine. The spoons got better with each one I did. I did a rough pass and then a fine finish pass to clean things up. Multiple rounds with the scrapers and putting them in the sun to see marks. Maple is quite hard and did not make things easy but the results are well worth the work. I did sharpen 3 times I think throughout the process. Maybe overkill but I am just getting used to both the tools and the sharpening process. Each honing took about 3 minutes, just enough to bring em back on the water stones, 1000/4000/8000. Possibly a strop is in order next time I get to Tandy to bring back the edge a bit without honing. Paul Sellers has a project on learning how to carve wood. I cannot say I am a sculptor by any definition but some things can be learned. 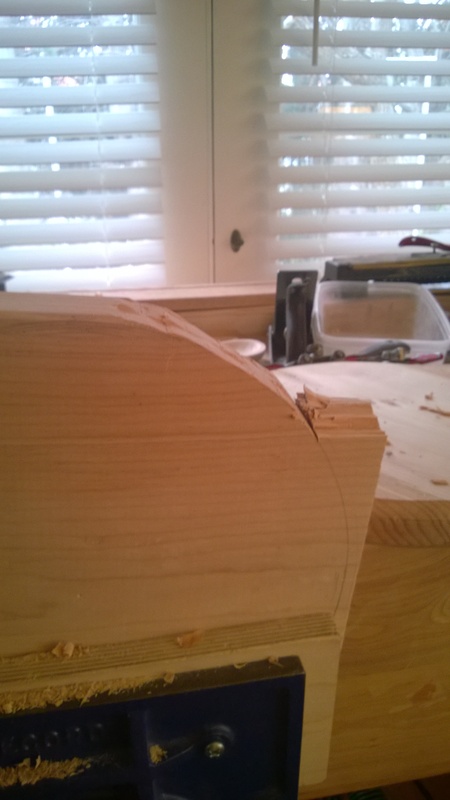 I started by using a coping saw to cut out the rough shape. I did this on piece of oak as well but I do not have a picture of that one. I simply sketched out something that looked like a spatula resembling the shape in Paul’s book. I cut out the rough shape with a coping saw. 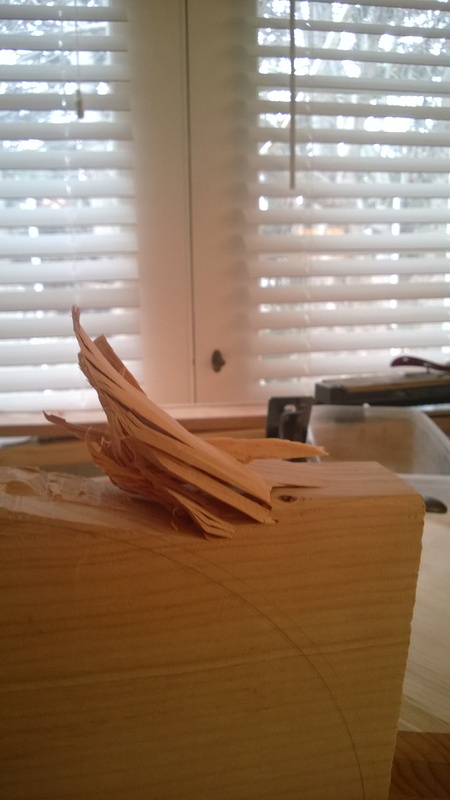 Coping saws work….slowly, I’ll look at more course blade for next time. With the rough shape, I had to thin it down a bit. 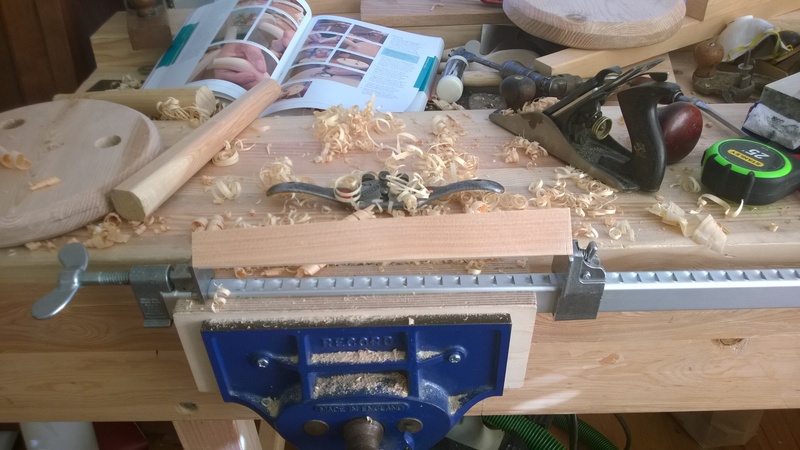 Now the spokeshave did a great job on the oak. It made quick work of things. When it came to the maple, not so quick. Sharp is key for maple, so I honed up the spokeshave blades and got to it. So round 3 entered the wood bandsaw. Maple is hard wood to cut much less plane down to spatula thickness. 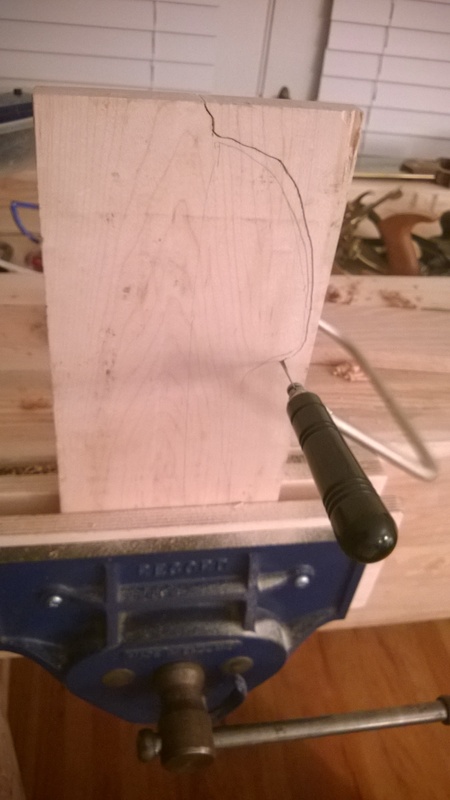 Since I have that wood bandsaw shown in an earlier post I decided to use it to re-saw the 3/4″ maple giving me stock for 2 spatulas instead of 1. 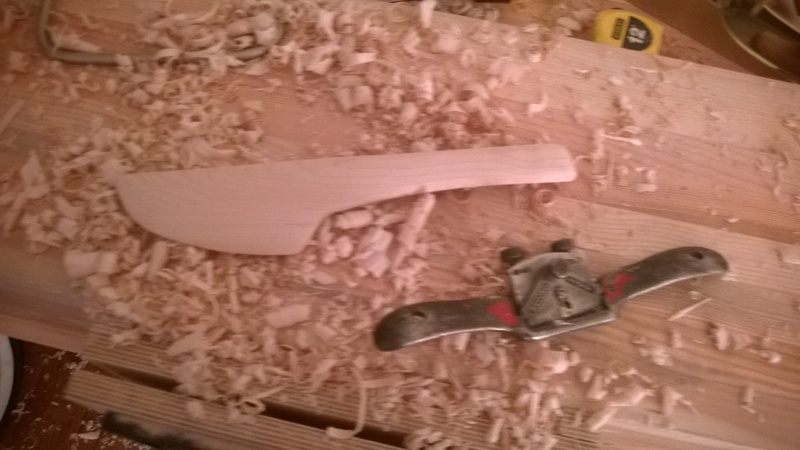 I also used it to trim close to the lines for less work with the spokeshave. To the purist hand tool worker out there, I don’t have unlimited time and well its my time so I went down the hard road twice and well enough of that. Notice I drilled first this round before I re-sawed so as not to split the maple. First one starts to take shape very quickly thanks to the bandsaw doing the worst of the stock removal. I used a Record 151 spokeshave. I picked it up the flat bottom spokeshave from Jim Bode Tools for a good price, the blade was full and a perfect user. I also picked up a round bottom, much more difficult to use I noticed but I was able to make it work for the tight curve. The final collection all treated with mineral oil. You can see I did not really use a template, something for next round. Onto spoons! Zig Zag Chairs with the design from 1934.